I'm not partial to this type of artwork where everything just looks blurry and out of focus (like I forgot to put my glasses on before viewing), which is the main reason I didn't give this book a higher rating. 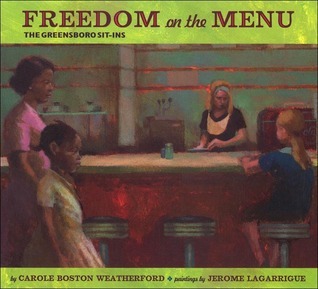 But the story itself, about the sit-ins and other civil disobedience begun at the Woolworth's lunch counter by four young men in Greensboro, North Carolina on February 1st, 1960, and told from the perspective of an 8-year-old black girl, was very moving and very informative. I wonder how many children and teens - or even adults - in our society today even know who are the Greensboro Four. The struggles experienced by the main characters of the story - not being allowed to use certain public facilities (i.e. lunch counters, water fountains, and especially bathrooms) - simply because of the color of their skin, are so poignant because of similar fights being waged today by others because of their gender identity or sexual orientation. I was especially happy that the book included references to those who had nothing to gain and much to lose by supporting the Greensboro Four and their efforts - such as the old white lady who told them loudly how proud she was of them. And those caught in the middle who (probably like the majority of people at the time) didn't have strong feelings either way but were just trying to do their job and get along under the prevailing system - such as the waitress at the lunch counter who had to refuse them service. Definitely a book I would recommend to those wanting to learn, and a simple and straight-forward way, more about the happenings of the time. 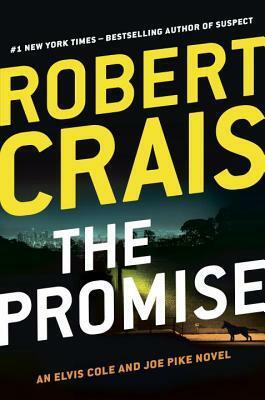 This is a great crime and mystery fiction book! I read it as the second in the series about Scott James & his K9 partner Maggie. Which I really hope there are more of in the future! I just love these characters. This is the first time that I've read an Elvis Cole or Joe Pike novel, but I think I may be checking out more of those as well. The story was compelling and surprising enough to retain some mystery through until almost the very end of the book. (Although I did find it very hard to believe that practically no one guessed Amy Breslyn's true plan until well towards the climax.) 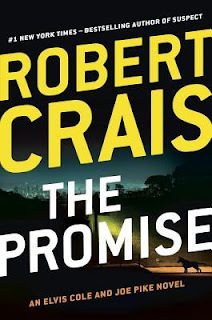 The writing style was such that it just kept drawing me on, making me not want to put the book down until it was done. The book kept switching perspective among many of the major characters, including Maggie, which made it very interesting to get some idea of how each of them viewed things. Most of this was done in third-person narrative mode. But the chapters focused on Elvis Cole were instead first-person, which I just found confusing and annoying. Otherwise, however, it was a really good read, and one that I would definitely recommend! I just was not impressed with this work! First of all, the artwork was horrible. I did not like the style at all. All of the characters had strangely pointy facial features. Janine was rendered just absurdly ugly and weird looking. And I couldn’t ever tell Peter and Ray apart. The story seems to begin in the middle of a plot in motion. There were several characters that it seemed we were supposed to know, but I didn’t have a clue as to who were they. The scene of negotiating the international deal was simply boring and dumb. 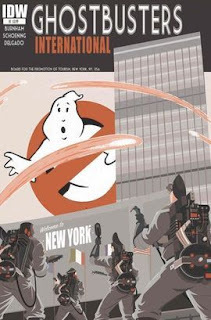 And there didn’t appear to be any reason for the Ghostbusters to be there. The story itself seemed like it could have been going somewhere, but the galley I read ended before anything really became clear. All in all, a huge disappointment! I received a free e-book partial galley of this book from NetGalley in exchange for an honest review. 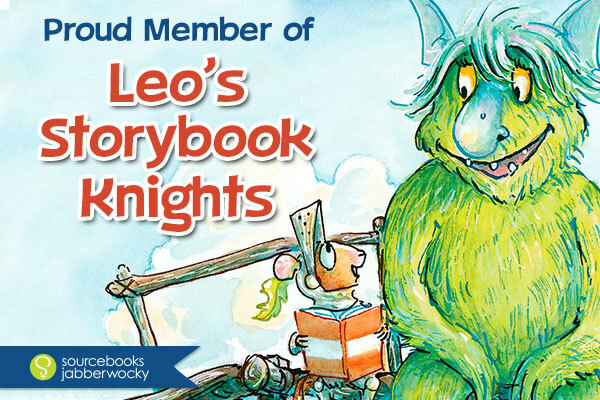 Definitely a fresh take on an old story! I was pleasantly surprised to learn of this new superhero whose character is uniquely her own. 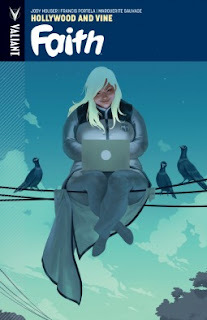 First there was a new superhero Canadian young woman (Superhero Girl), then a Muslim teen girl (Ms Marvel AKA Kamala Khan); and now this overweight, young adult woman from Valiant Entertainment. Talk about turning the genre on its ear! No more are all the heroes these pasty, middle-aged, white dudes in tights. I love it! I was very pleasantly surprised to find that the comic seemed to live up to the hype of its promo description. While the galley I read contained only the first two volumes of the series (where the actual graphic novel will contain the first four), it still presented enough story to draw me in. The characters were minimally introduced, the bad guys hinted at but not really explained; basically, the background was set for the anticipated action of the coming battle. Although only from the intro material did I know that it is an alien invasion that Zephyr (AKA Faith, AKA Summer) will be fighting. I did feel like, even though these were the first editions in the series, there was an awful lot of backstory that I should know, even though the reader isn’t really made privy to it, at least not yet. All the stuff about “psionically gifted ‘psiots’ discovered by the Harbinger Foundation” just left me wondering… Who? Where? What now?? 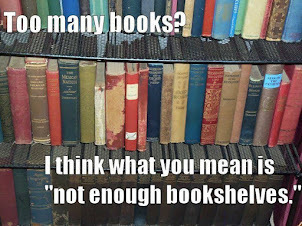 But hopefully more of that will be filled in as the series progresses. The artwork was clear, concise and easy to follow, with clear definitions between each of the seemingly main and secondary characters, with subtle differences even between some of the minor characters who were apparently supposed to look very similar. I’m already enjoying Zephyr, glad she dumped her loser ex-hero-turned-reality-TV-star boyfriend, anxious to learn more about her friends and coworkers, and to see if things get more interesting with her new neighbor! It is definitely invigorating to see the diversity and fresh view that this character brings to the genre. I can’t wait to read the entire volume, and any that may follow it. I received a free partial galley of this book from NetGalley in exchange for an honest review.